When looking to buy Chicago new homes this year prospective buyers will often focus their search around cost, but what they don’t know is that they might want to take another number besides the price into consideration. The number is the home’s Home Energy Rating System (HERS) Index Score, which was developed by RESNET to determine a home’s energy performance. 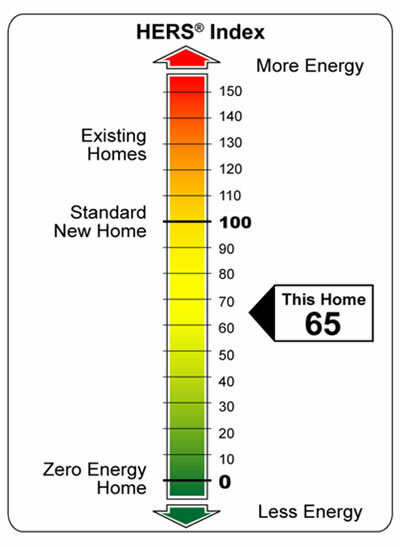 How it works is that a home rated on the HERS index receives a score based upon its energy performance; the lower the score, the more energy efficient the home is. Currently, according to the U.S. Department of Energy a typical resale home scores a 130 on the HERS Index compared to a rating of 100 for a standard new home. This means a resale home is 30 percent less efficient than a standard new home, which could cost you about $539 in annual energy savings. How important is it for prospective buyers to learn about a home’s HERS Index Score during their search? Well, it pays to know the HERS Index Score before they buy because they will be able to know the projected energy costs of living in the home. Having a more energy efficient home can also result in a higher resale price for any future needs. Ultimately though, knowing a home’s HERS Index Score will give buyers security and peace of mind about their home’s energy use and how they can improve it if need be. One easy way for homeowners to improve their home’s energy efficiency is by using propane. Propane is one of the more sustainable fuels, provides a low carbon footprint and is produced domestically. Homeowners can even equip their homes with propane air-conditioning systems now. Prospective buyers should not fret though if they are not supplied with a home’s HERS Index Score immediately. It is only a simple request away. For more information on all things Chicago real estate, be sure to check out our site.